Helen’s perchlet (Plectranthias helenae) larvae were raised from wild-spawned eggs at 77-79F on wild copepods and artemia. The larval duration was 31 days. First record of Helen’s perchlet culture. Anthias (Anthiine serranids) are small to medium-sized, brightly colored reef fishes comprising 25 genera and over 200 species. They are planktivores and often form large schools above the reef while feeding. Their peaceful nature and vivid color patterns make them very popular in the aquarium trade. Most anthias species will spawn readily in captivity but are rarely aquacultured because the larval phase is long and complicated. Helen’s Perchlet (Plectranthias helenae) juvenile reared in the laboratory. Plectranthias have an interesting temperament and can be visually stunning. They are also reef-safe and very hardy, adapting quickly to aquariums. Avid aquarists thus seek after them, esp for their nano reef tanks. Shallow water Plectranthias species that regularly reach the aquarium trade remain affordable but most deep water species are rarely collected and command prices in excess of $1000. Helen’s Perchlet (Plectranthias helenae) was reared from a small number eggs collected in waters off Oahu in the spring, 2015. This species is only known from a handful of collections made in Taiwan, the Hawaiian Islands and Japan at depths between 119-263 m (390-863 feet). It reportedly grows to 10 cm (4”). Helen’s Perchlet (Plectranthias helenae) larvae reared in the laboratory. P. helenae eggs are clear, spherical and small (0.75 mm diameter), with a single oil droplet. The larvae measure about 2 mm TL at hatching, begin to feed two days after hatching (dph) (3.1 mm TL), begin flexion near 12 dph (6.8 mm TL), and complete juvenile transition by about 31 dph (15.1 mm TL). 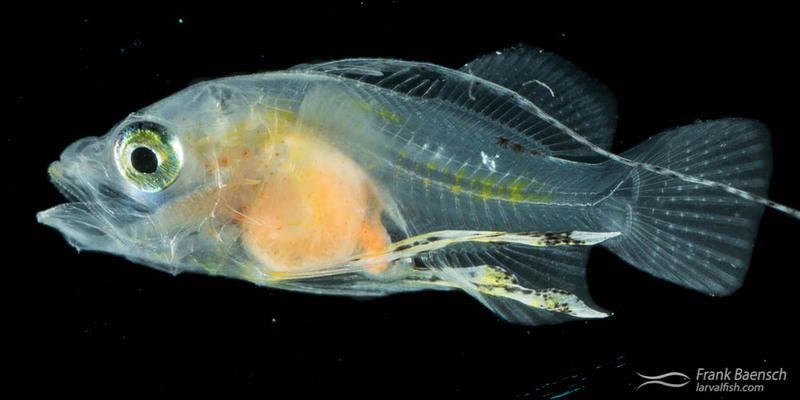 Features of P. helenae larvae include a very long pre-dorsal element, long ornamented pelvic fin rays and pronounced head spination. The juveniles were grown out for over 100 dph (31 mm TL). The P. helenae larval phase is significantly shorter than that of P. winniensis (settled near 80 dph), a species previously raised for this project using a similar rearing technique. The larval forms of 27 dph P. winniensis and P. helanae are depicted below. It’s amazing how differently these two cogeneric species have evolved! P. winniensis larva (top) with its enormous pectoral fins and P. helenae (bottom) with its large pelvic fins and extremely long dorsal fin extension.